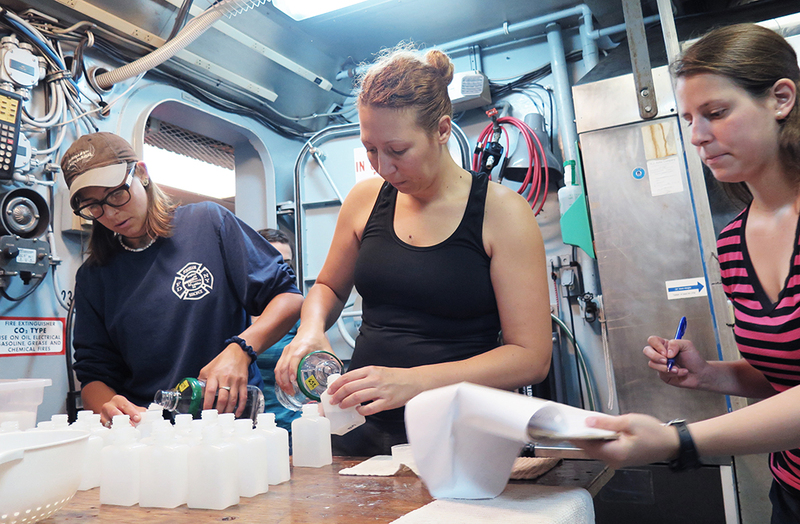 This past summer, Eva Lincoln was working in an unfamiliar place: a boat at the edge of the continental shelf, facing 12-foot swells and waking up at 2 a.m. to process water samples with tiny specks of phytoplankton in them. And she loved it. For 10 weeks, Lincoln was immersed in hands-on, oceanographic research as a SURF student, working under Dr. Susanne Menden-Deuer, professor at URI’s Graduate School of Oceanography and a leading expert on plankton ecology. “She gave me the reins and said, ‘I want you to figure out what aspects of oceanography you find interesting, and then we can build a project from there,’” says Lincoln. At the end of her SURF experience, Lincoln was invited by Menden-Deuer to conduct research aboard the R/V Endeavor. Working with a fellow undergraduate, Lincoln filtered the water samples over 24-hour and then 12-hour periods in order to achieve the most accurate chlorophyll readings. The data collected will help scientists on board better understand how quickly plankton, the base of the marine food web, grow and die. Functioning as a researcher on board a ship was an entirely separate, and important, lesson for Lincoln. The fourth-year RIC student, who also tutors anatomy and physiology at the Community College of Rhode Island, has always had a deeply inquisitive mind, and wanted to know more about plankton interactions in marine food webs. Dr. Sarah Knowlton, Lincoln’s advisor and chair of physical sciences at RIC, first suggested SURF as a possible research experience, meeting with the undergraduate this past spring to guide her through the application process. Lincoln presented her research on single-cell herbivores, or ‘microzooplankton,’ at the annual SURF conference this past July. For her work, she was honored by Rhode Island Commerce Secretary Stefan Pryor at July’s SURF Conference for producing outstanding research. 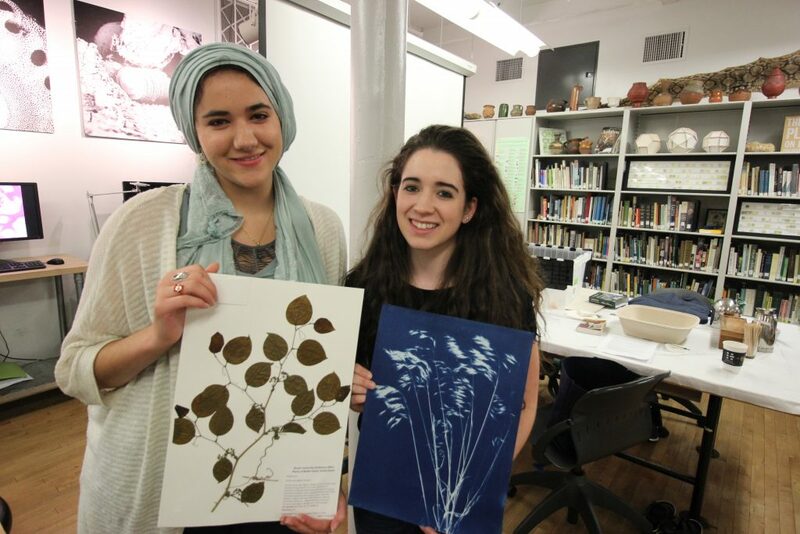 The RIC senior knows that she loves the environment and chemistry. Now, Lincoln’s focus is getting accepted to the best-fitting graduate program. RISD graduate student and C-AIM researcher Stewart Copeland in his Providence studio developing new 3D models of the Bay Observatory’s equipment. Stewart Copeland has been a webmaster, documentary filmmaker, and even a touring musician over the past 10 years. 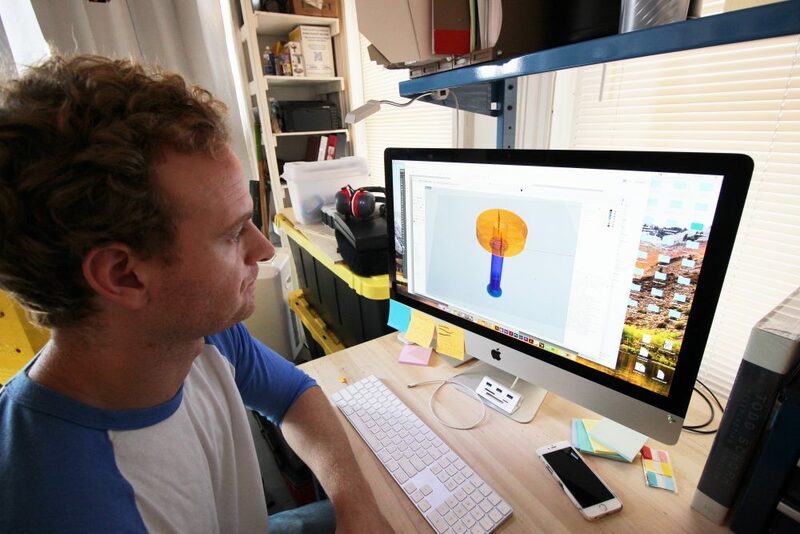 Now, the Tennessee native is developing 3D models of sensor buoys which comprise the integrated Bay Observatory, a new array of equipment to monitor the ecological changes of Narragansett Bay. The observatory, which is being deployed by the Rhode Island Consortium for Coastal Ecology Assessment, Innovation and Modeling (RI C-AIM), encompasses multiple marine research tools that will gather new data about Narragansett Bay’s ecosystems, from nutrient concentrations and phytoplankton populations to water circulation patterns. But Copeland, alongside Neal Overstrom, a co-principal investigator for the consortium and the Nature Lab’s director, is working to visualize not the data collected from the observatory through 3D modeling, but these tools which make subsequent research possible. Copeland starts his 3D modeling process by examining the buoys and creating technical drawings. The buoys will be moored at specific locations in Narragansett Bay this coming spring. Overstrom likened the buoys to a Mars rover, a vehicle oftentimes drawing more interest as a sojourning machine than in the data it collects. Copeland is also working closely with Dr. Harold ‘Bud’ Vincent, lead researcher for RI C-AIM coordinating the installation of the Bay Observatory’s equipment. After creating technical drawings, Copeland takes a multitude of photos of the sensor buoy equipment, which he will utilize in a 3D visualizing computer program. For Copeland, the test is utilizing current modeling technology to develop the most detailed 3D representations. Funded by a $19 million grant from the NSF through EPSCoR, and also a $3.8 million state match, the consortium is a collaboration of engineers, scientists, designers and communicators from eight higher education institutions across the state—University of Rhode Island (lead), Brown University, Bryant University, Providence College, Rhode Island College, Rhode Island School of Design, Roger Williams University, and Salve Regina University—across the state developing a new research infrastructure to assess, predict and respond to the effects of climate variability on coastal ecosystems. Working together with businesses and area communities, the consortium seeks to position Rhode Island as a center of excellence for researchers on Narragansett Bay and beyond. For more information about the consortium and its researchers at institutions across the state, including URI, visit http://www.uri.edu/rinsfepscor. 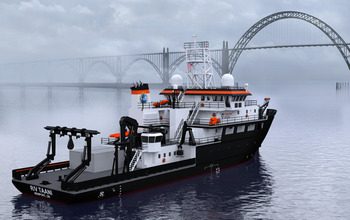 Operated by Oregon State University (OSU), Taani (pronounced “tahnee”), a word that means “offshore” in the language of the Siletz people of the Pacific Northwest, will be the first in a series of Regional Class Research Vessels funded by the National Science Foundation (NSF). “NSF is proud that Taani will be the flagship for a new class of research vessels, and we eagerly anticipate decades of productive oceanography from Taani to support the nation’s science, engineering and education needs,” says Terrence Quinn, director of NSF’s Division of Ocean Sciences. During the ceremony, former OSU president John Byrne and his wife Shirley, the ship’s ceremonial sponsors, inscribed their initials into the ship’s keel. NSF selected OSU to lead the design, shipyard selection, construction and transition to operations for as many as three new Regional Class Research Vessels for the U.S. Academic Research Fleet. The National Science Board — NSF’s oversight body — authorized as much as $365 million for the project as part of NSF’s Major Research Equipment and Facilities Construction portfolio. Dr. Christopher Reid and SURF student Krystyna Kula in the lab at Bryant. When Krystyna Kula was a child, she learned first-hand about Narragansett Bay as a volunteer for Save The Bay. Now, the Smithfield native is spending her summer with Bryant University’s Dr. Christopher Reid, studying how micro-organisms transport carbon and other nutrients into larger species. Kula has collaborated with SURF mentors Dr. Tatiana Rynearson and Dr. Susanne Menden-Deuer, to complete her research on lipids at the University of Rhode Island’s Graduate School of Oceanography. The end goal, says Reid, is to better understand how hydrocarbons, called ‘lipids,’ travel through ingestion from the tiniest zooplankton to economically important species such as shellfish, a process known as ‘trophic upgrading’. He adds that understanding how many lipids the dinoflagellate consumes could lead to using the species as a biomarker for chemicals appearing in the bay. “That is the pie in the sky goal,” he admits. For Kula, her first experience in a research lab has been much different from the classroom, learning to use equipment such as a gas-chromatography machine to separate and identify chemicals from water samples. Reid, who hosts as small group of undergraduate and graduate researchers at Bryant, tries to foster a friendly working environment through which students can learn together. Although she has a few years before deciding on graduate school, Kula knows the experience will serve her well. Roger Williams University junior Leah Hintz does not mind sitting in front of the microscope, so long as her specimen, a species of coral found in the waters off Fort Wetherill in Jamestown, does what she hopes: ingest microplastic beads. RWU’s Dr. Koty Sharp shows how Astrangia poculata ingest microscopic plastic beads to SURF Leah Hintz. But why is Leah, a Fairfield, Conn. native, feeding the tiniest plastic particles to this coral, named Astrangia poculata? To discover how one of the world’s most concerning environmental hazards is affecting food webs at the microscopic level. By measuring how many microplastics the local coral ingests, scientists are using the species as a biomarker indicating plastic levels in waters which may seem clean, especially in urban areas. A close-up of Astrangia poculata as it ingests plastic microbeads. 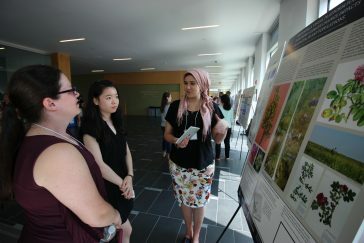 As an assistant professor of Biology at RWU, Sharp has been impressed by Leah and her fellow undergraduate researchers as they developed novel ways to measure how microplastics affect species such as Astrangia. Leah and her colleagues, for example, needed to figure out a way to trap microplastic beads within the waters off Fort Wetherill for a period of time so that local seawater microbes would grow on them. Their solution was simple; small piece of PVC pipe wrapped on both sides by a nylon mesh. The SURF researchers could thus bring the beads covered in microbes back into the lab and examine how microbes on the surface of microplastics influence how much plastic Astrangia eats. Throughout the 10 weeks of SURF, Leah has exhibited a unique passion for research, and will continue studying coral in Bermuda this fall. “She is my Ms. Positivity in the lab,” laughs Sharp.